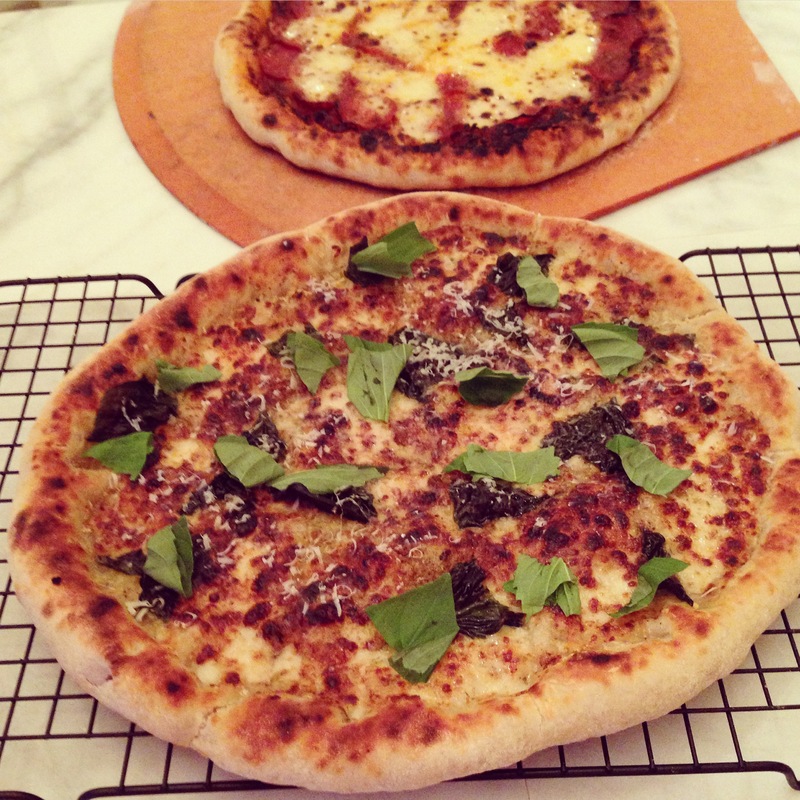 I love making pizza its one of my favorite things, but making pizza for parties…. Well it always sounds like a better idea in my head. I have these visions of me tossing dough sky-high and forming perfectly round pies and cranking out pizzas that would make any Italian proud in no time flat. In reality my kitchen (and me) are covered in flour, the pizzas are not cooking as fast as I need them too, and inevitability I will get in a fight with my pizza peel while all my guests are watching. Ugh Nightmare!!! So what’s the solution to this problem? 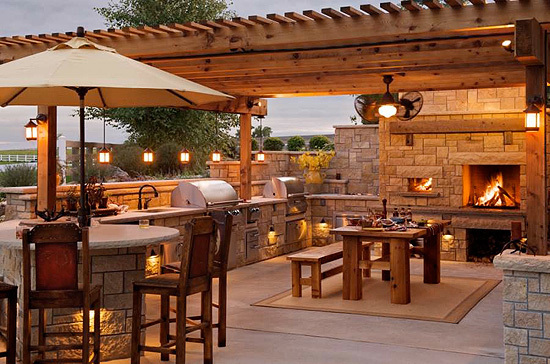 An outdoor dream kitchen, complete with a wood-burning oven that cooks pizzas in 90 seconds…. 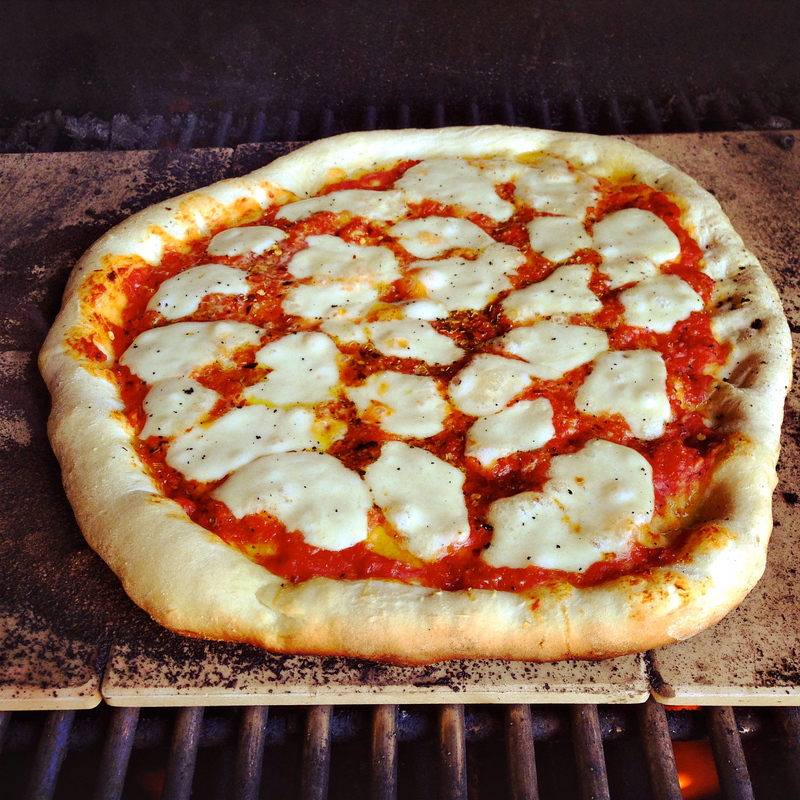 Okay, since my outdoor dream kitchen isn’t a reality I had to come up with another solution to make pizzas for large parties and this solution can be found in almost every kitchen…. Yes we are going to make mini pizzas in muffin tins!!! First I make a batch of pizza dough. I usually don’t have time to make pizza dough right before guest arrive so make it a day or two or three ahead of time and when you are ready to use it pull it out of the refrigerator and let it rise until doubled in size. This will take about 1½ – 2 hours. Once the dough has risen, roll it out on a well-floured surface until it’s about ½ inch thick. Then spray 2 – 12 cup muffin tins with olive oil. Then using a 3-inch round cookie/biscuit cutter cut out 24 circles of dough. Stretch out each little dough circle until it is about 4 inches in diameter then press each circle of dough into the muffin tin. Then fill each cup with desired toppings. For the first batch I did 1 pepperoni in the bottom, then a small spoonful of sauce, a little shredded mozzarella cheese, then a spoonful of (pre-cooked) crumbled Italian sausage and finally just a little more cheese and chopped pepperoni. Cover the pizzas loosely with plastic wrap and let them rise for another hour. 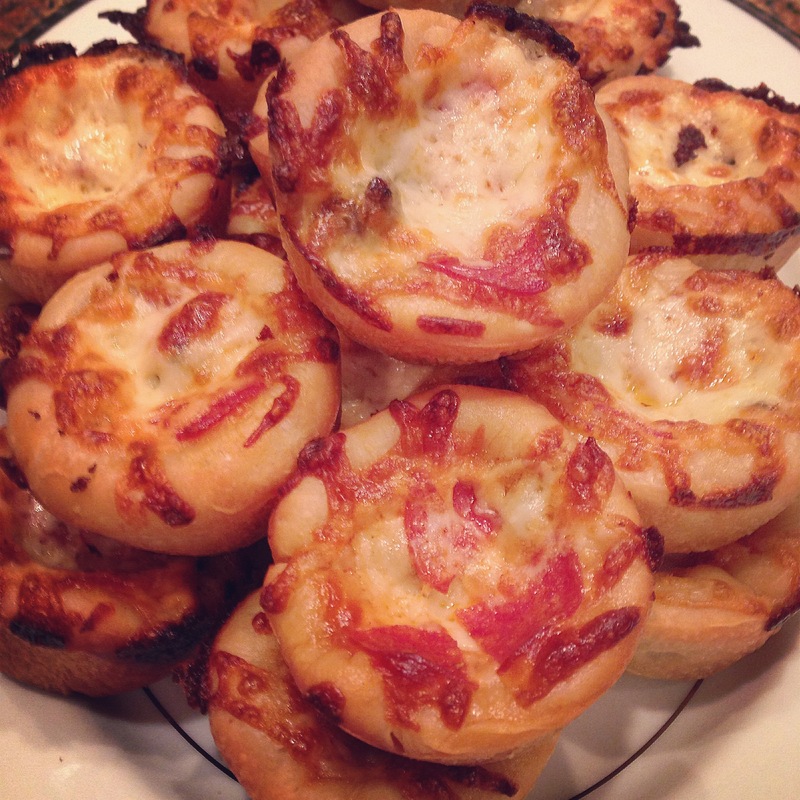 Once the mini pizzas have puffed up place them in the pre-heated oven and bake for 15-20 minutes until golden brown. 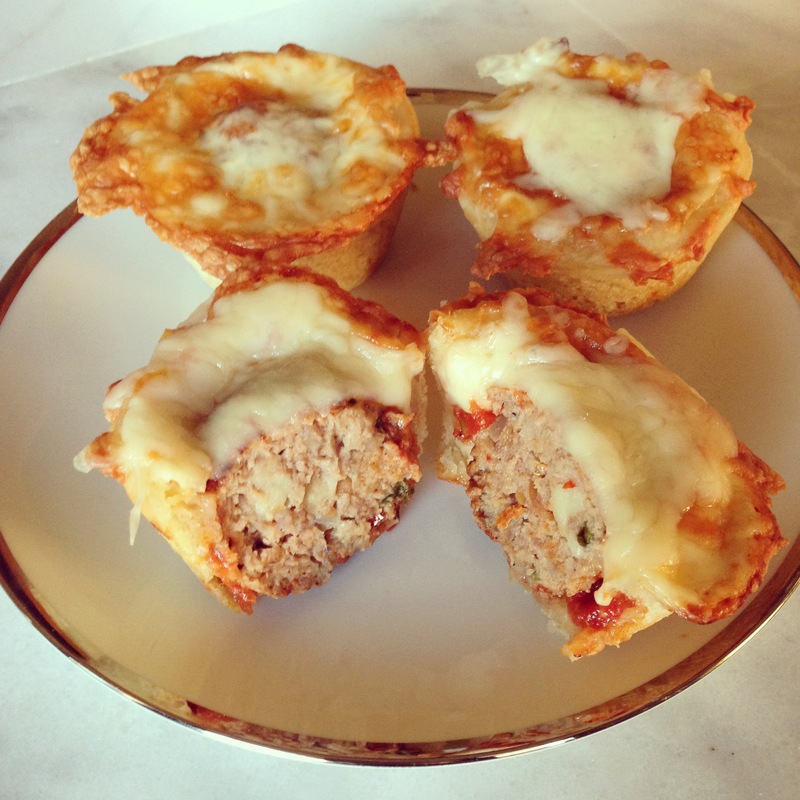 The second time I made these mini pizzas I was craving meatballs and it got me thinking… What would be better that a mini pizzas stuffed with a meatball?!?!? Tear the Italian Bread in to chunks then place it in a bowl with 1 cup of milk and set it aside. Soaking the bread ensures that you have a moist meatball. In a large mixing bowl add the ground beef, ground pork, grated garlic, minced onion, chopped parsley, the sun-dried tomato spread (or tomato paste), red pepper flakes, the grated Parmigiano Reggiano cheese and 2 Teaspoons of Salt and Black pepper to taste. Squeeze all of the extra milk out of the bread and crumble the Italian Bread over the meat mixture. With your hands lightly mix everything together. Don’t squeeze or compact the meat mixture or you will have a tough meatball. 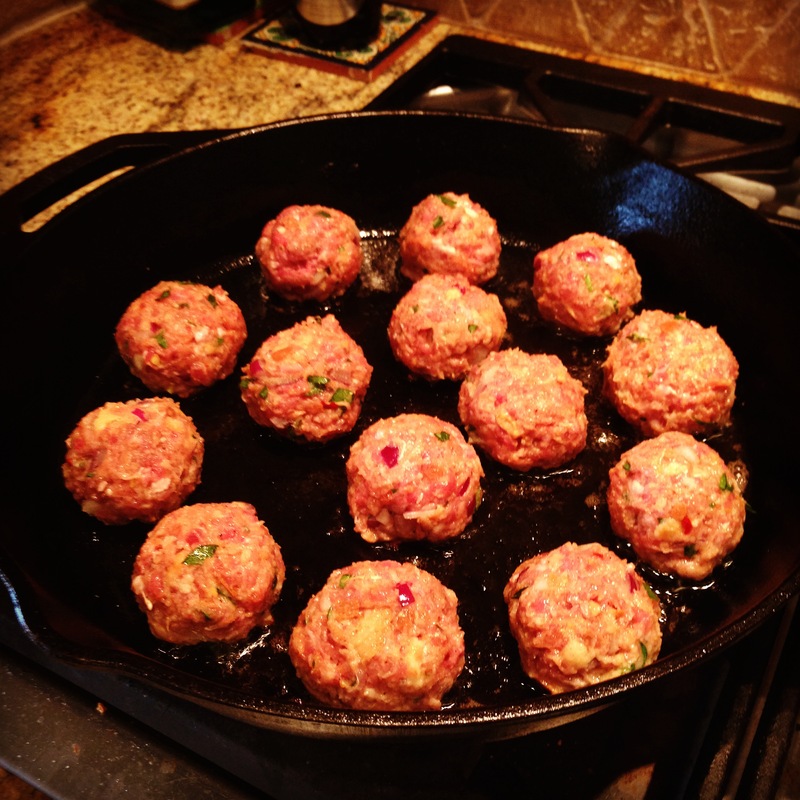 With your hands, shape the meatballs slightly smaller than a golf ball. You should get about 36 – 40 meatballs at this size. Heat up a large skillet (I like my cast iron skillet for this) over medium-high heat with 3 tablespoons of Extra Virgin Olive Oil. In a large pot over medium low heat, sauté the onion, garlic, and red pepper flakes until tender. Add the crushed tomatoes, fresh herbs and salt and pepper to taste. Bring the sauce up to a bubble and add in the browned meatballs. Cover and simmer for 45 minutes to 1 hour stirring occasionally. 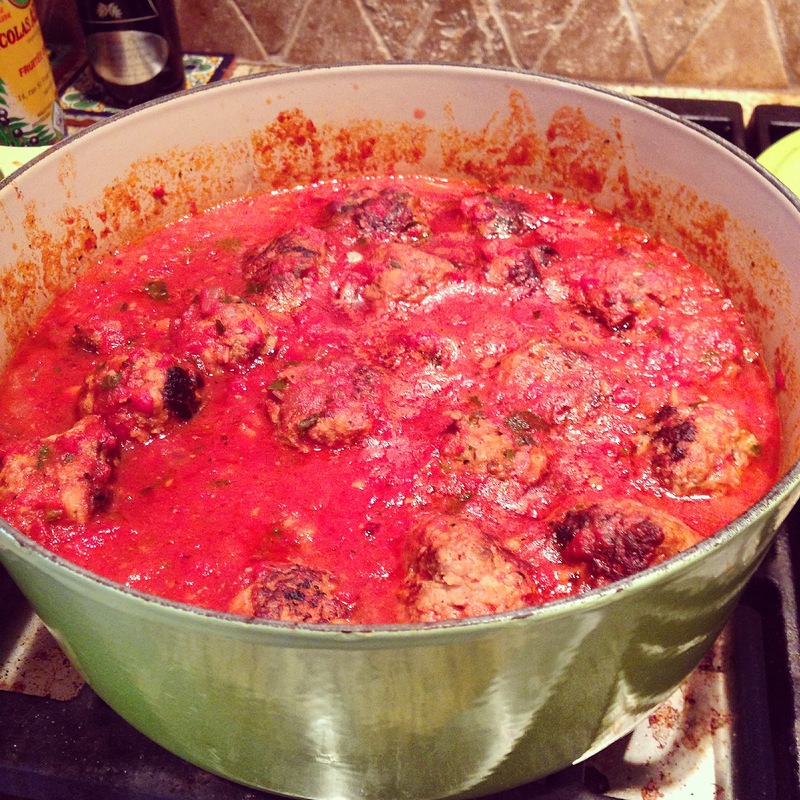 Allow the meatballs to cool then remove the meatballs from the sauce and store in a container with a tight-fitting lid. Store the sauce in a separate container. 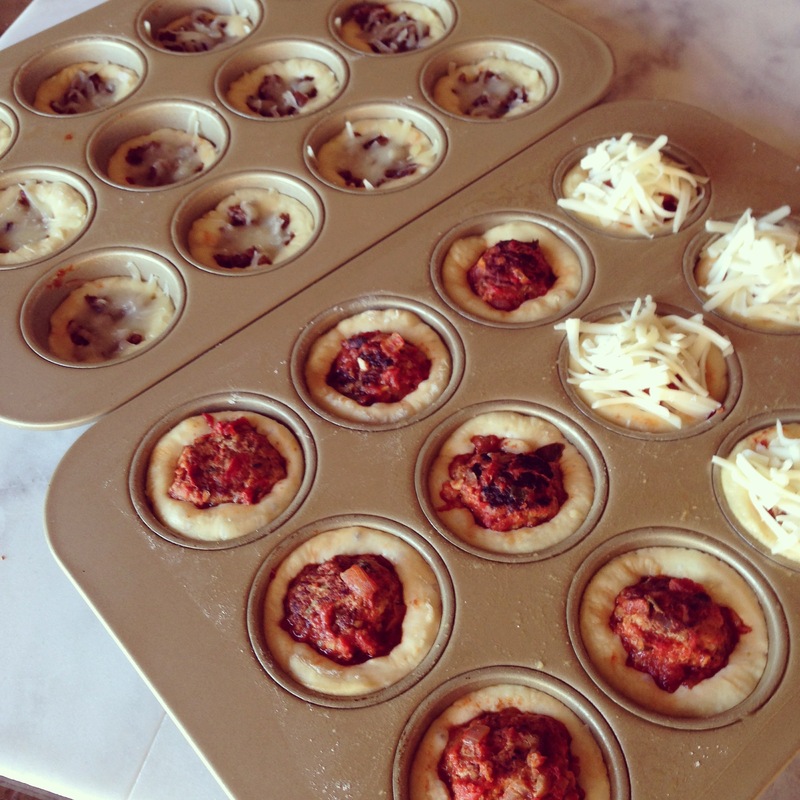 Press the cut out rounds of pizza dough into the muffin tins and fill with a spoonful of the sauce, one meatball and top with a little shredded mozzarella. 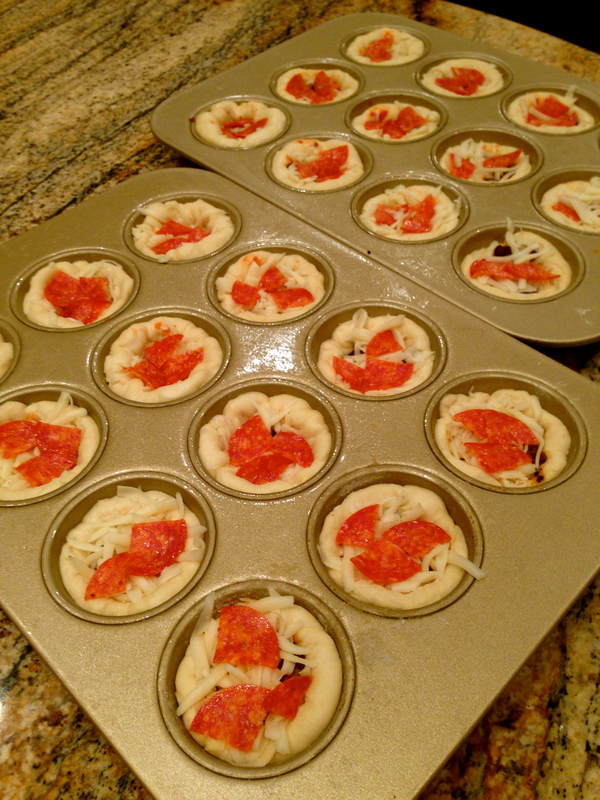 Cover the mini pizzas with plastic wrap and allow the dough to rise for 1 hour. Pre-heat oven to 425 degrees and bake the pizzas for 15-20 minutes until golden brown. Top with additional cheese halfway through the cooking time. 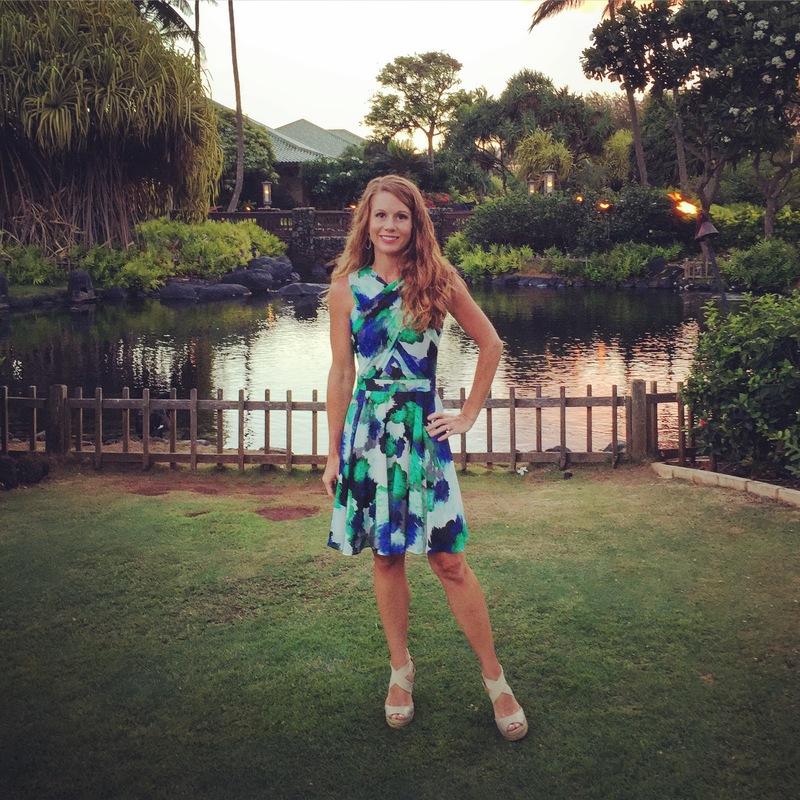 Fabulous recipes! The meatballs look so yummy, too! Your mini pizzas look great! I have found the muffin tin to work perfectly for mini pizzas.